Shoes, shoes, shoes and more shoes: We have on hand the remaining shoe stocks amassed by the now defunct firm Manifest Destiny. Those of you who dealt with Burbank, owner of Manifest Destiny, are probably sad to hear that he has thrown in the towel on the shoe business. However, Burbank has not forgotten you and has placed his remaining stocks with us. For a limited time we are offering the following high top shoes. When these shoes are gone, there will be no more. Offered by Manifest Destiny as it's WW II shoe. I've been told by customers that this shoe is very true to the US Army 1940's issue and better made than the reproductions currently available. I'll just have to take their word for it as such comparisons are beyond my experience. 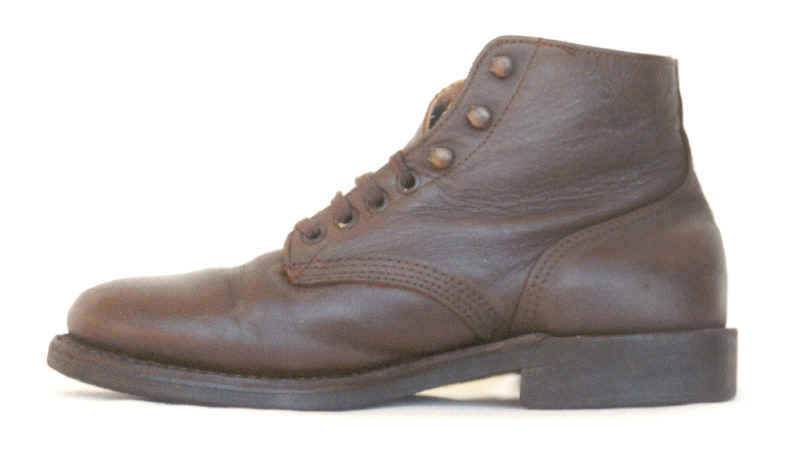 Burbank also notes that with a leather resole job, this shoe is well liked by reenactors in His Majesty's Spanish Army posted in Cuba and the Philippines. Available in sizes 9 through 14, in grades 2 and 3. Offered by Manifest Destiny as it's U.S. Spanish American War type shoe. Except for a somewhat larger toe profile, the box toe shoes are essentially the same shoe as the round toe shoe listed above. With a leather resole job, these shoes would pass any SAW inspection. Available in sizes 7 through 15. A few pairs are in grade 1 condition but most are in grades 2 and 3. Customers please note. All these surplus shoes are used. The condition grades range from 1 to 3. Grade 1: Nearly new shoes. Little to no wear on the soles and uppers in near flawless condition. Price: $60.00/pair. Grade 2: Fine to very good condition shoes. 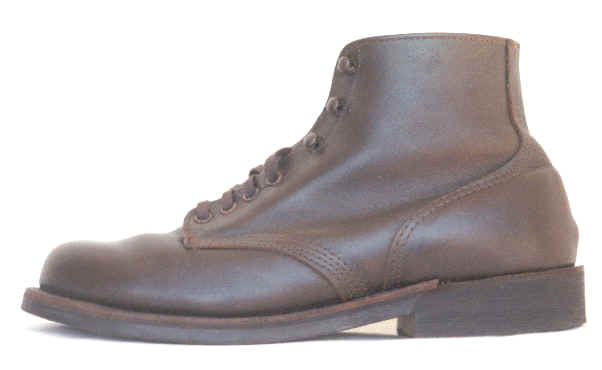 In general grade 2 shoes exhibit light wear to uppers and soles. Price: $45.00/pair. Grade 3: Good condition shoes. In general grade 3 shoes exhibit moderate wear to uppers and soles and are serviceable as is. Any shoe with a loose or missing heel, or loose sole stitching is automatically classed a grade 3 shoe. Many of these shoes have grade 1 or 2 uppers. Such shoes are great for resoling with leather for the 1898 crowd. Price: $30.00/pair.